Heavy rains and convection across eastern and northern parts of the island of Kauai, Hawai‘i resulted in multiple reports of very heavy rainfall and flooding on 14-15 April 2018. 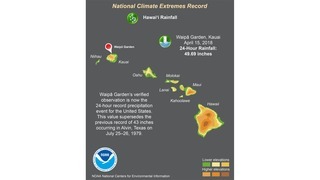 After considering the observation and the various surrounding factors, the NCEC determined the Waipā Garden observation to be valid, and it now stands as the 24-hour record precipitation for the United States. This value supersedes the previous record of 43.00” occurring 25-26 July 1979 at Alvin, Texas. The previous U.S. 24-hour precipitation record was 43 inches, near Alvin, Texas, on 25-26 July 1979, in association with landfall of Tropical Storm Claudette. This rainfall record, already familiar to the applied climatology community, was established by the NCEC when originally constituted in 2000. As is the case with the Waipā Garden observation, the Alvin observation was recorded by an unofficial observer, but one known to and trusted by the local NWS forecast office. This event was variously memorialized as 42” (the value adopted by the Texas State Climate Extremes Committee) and 43” (as adopted by the National Climate Extremes Committee). The cause for the discrepancy is unknown. It is possible that the additional inch accounts for rainfall lost to observation during periods when the observer’s direct-read rain gauge overflowed its 10” capacity. AUSTIN (KXAN) — The variables that most frequently cause flash flooding in central Texas are coming together as we speak, leading to the possibility of up to 6-7" of rain in a few isolated locations. Rain totals in our area should most commonly reach 1" to 3" by the time the storms wrap up late tonight, but may more commonly add up to 2" to 4" from Austin northward. A few isolated locations could record up to 6-7" of rain. It is very difficult to forecast where these highest rain totals may fall due to small-scale boundary interactions as the storms evolve.